Q: IS THERE A RIGHT AND WRONG WAY TO INSTALL SOLAR SCREENS? are not in accordance with U.S. Dept. of Energy's recommendations. the bottom picture to the right)! Q: HOW DO SOLAR SCREENS KEEP THE HEAT OUT? A: Unlike fiberglass screens, Phifer Suntex solar screens are made of a polyester vinyl coated screen material designed to absorb and deflect the heat before entering your home. Q: WHAT CAN I EXPECT IN ENERGY SAVINGS? A: Previous customers have reported a 25-45 percent savings on their energy bill. 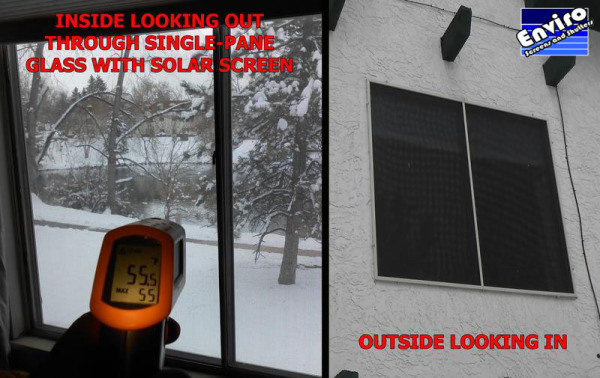 Q: HOW DO SOLAR SCREENS EFFECT THE NATURAL LIGHTING AND TEMPERATURE OF MY HOME? A: There are two variations of the Solar Screens. 1. 80% grade - Darkens up to 25% and cools up to 34 degrees. 2. 90% grade - Darkens up to 40% and cools up to 38 degrees. Q: WHAT IS THE INSTALLATION TIME TO GET SOLAR SCREENS ON MY HOME/BUSINESS? A: From the date of purchase, solar screens can usually be installed within 2-5 weeks (depending on the season and the amount of jobs in manufacturing). Most applications take 2-3 hours of on-sight installation time. Q: SOLAR SCREENS VS. WINDOW TINT ON GLASS? penetgrating the home's exterior, thus reducing the heat as well as stopping the fading. into your home or business. Q: WILL SOLAR SCREENS PROTECT MY HOME INTERIOR FROM FADING? furniture and upholstery that bares the direcT abuse of heat and sun rays. Q: WHAT MAKES US DIFFERENT FROM OTHER COMPANIES? A: The biggest difference between solar screens is not only the screen material but the frame construction. We use some of the strongest frame material available which is 1" wide x 7/16 frame, whereas inexperienced companies will use a 3/4" wide x 5/16 frame which can cause the screen to sag, bow, bag and/or become loose over time. How your screens are installed is also an important part of the longevity of your solar screens and windows. Our expert installers will examine your windows to find the correct placement of screws and clips, if needed. This is done so that you as the homeowner will be able to remove and install the screens with ease. Q: SHOULD I CHOOSE 80% OR 90% SOLAR SCREEN MESH? A: There are a few reasons, the most common is to allow more sunlight to illuminate the room while still having some protection. Common applications for Suntex 80 are windows where the sun exposure is minimal, or on any room where maximum natural light is preferred. Q: WILL SUNTEX 90% BLOCK TOO MUCH LIGHT, MAKING MY ROOMS TOO DARK? A: Suntex 90 does make a noticeable change in the lighting of your rooms. It's a natural tradeoff, blocking most of the sun's heat does require a reduction in the amount of light coming in. In the end it is a personal choice and only you can say how much light is needed in your home. It may help to consider which concerns you more: having too much heat, -or- having too much shade. Look at this picture, the straight-ahead daylight view is actually better than the old 70% sun screens (but the room will be darker). If you are trying see out at an extreme angle to the window then your view will be blocked, it's the same properties that block more of the sun as the angle gets sharper. Q: WHAT ABOUT LOW-E WINDOWS. DO I NEED SOLAR SCREENS? A: There are two factors to consider in energy efficient low-E windows. The first is the insulating or R-value, which is the ability to stop thermal energy (cool or warm air) from passing through. The second is the Shading Coefficient (SC), or the ability of solar energy to pass through. In our climate a low SC is desired (yes, it's backwards - a low SC means greater shading ability). Some low-E windows have achieved an SC of .35, which is comparable to a shading efficiency of about 10%. Solar screens do remain as the most effective at rejecting solar energy, but the choice is a personal one. The lowest possible cooling bills would be achieved with the lowest SC value (Suntex 90 has an SC of approximately .07). Q: HOW DO I KEEP MY SOLAR SCREENS CLEAN? A: If they are just dusty a light rinsing with a hose should easily take the dust off. When dirt becomes "baked" on the screen they are a little harder to clean. A soft window scrubber and some mild detergent (such as Dawn) should do the trick. Be sure to rinse the screen off well to remove all the detergent. Also take care not to stretch the screen out of shape. Q: DO SOLAR SCREENS AFFECT MY WINDOW WARRANTY? A: No. Our Solar Screens are attached over the window, not to the window. Tint or films applied to the glass often void the warranty. The window warranty will not cover attachments to the window (it doesn't need to, the screens have their own warranty). Read your own window warranty and I think you will find it is reasonable and aligned with common sense logic. 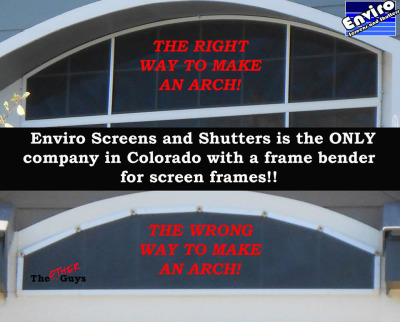 Properly installed screens do not interfere in any way with the function or integrity of the window, and should not adversely affect the window warranty. INTERIOR SHADES OR LOW-E WINDOWS? Gain Coefficient ratings of anywhere between .40 to .98.
should, too, be a low number as it represents the reflecting of the Sun towards the Window, while the AS (Solar Absorbance) should be high as this represents the amount of Sun the Screen/Shade is holding within the fabric so it doesn't reach the window. Q: HOW DO WINDOW AND TINT COMPANIES CLAIM BETTER UV PROTECTION THAN OTHER WINDOW HEAT REDUCTION PRODUCTS? A: The trick to this sales technique are the words "UV Protection". Most if not all window and window tint manufacturers and distributors use this misleading terminology. First, window tint does not provide better "UV Protection", it just simply provides UV Protection and that's it, very much comparable to other like products. Second, the trick is that UV Protection doesn't COOL your home/business, it simply yields fading of items within your home. Third, the Solar Energy that enters your home or business is made up of several types Electromagnetic Radiants, such as microwaves, infrared radiation, visible light, gamma rays, ultraviolet radiation (UV-Rays), and x-rays. UV-Rays only make up 4% of this total energy from the Sun. Therefore, when a salesman approaches a customer and states that his/her window or tint reduces 70% - 90% of "UV-Rays", essentially they are telling you that they can reduce the Sun's energy entering your home by 3% - 4%. Additionally, while window tint has a long history of disappointed customers, it can also void window warranties and crack windows panes. WHEREAS, a solar screen reduces the SUN's TOTAL ENERGY by 80% to 90% does not affect the window warranties and has never cracked a window, actually to the contrary it protects windows from the sun's damaging effects. Q: CAN THE SUN'S REFLECTION OFF MY WINDOWS BURN MY GRASS AND BUSHES? A: Most definitely!! 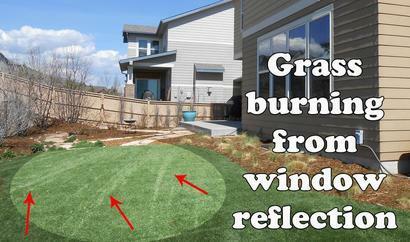 We have customers contact us all the time about their windows (especially Low-E windows) burning their grass and bushes. 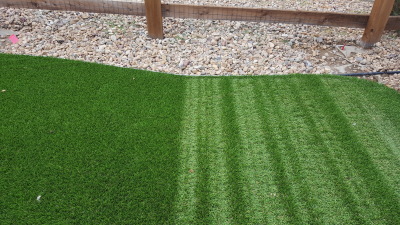 We have even had customers contact us with the same problems melting their artificial grass. The sun's reflection off windows is very powerful. 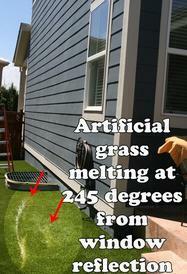 For example, the melting point of artificial grass is about 245 degrees. Q: WHEN IS A WARRANTY AN ACTUAL WARRANTY IN COLORADO? A: Some manufacturers claim to have a "LIFETIME WARRANTY". In Colorado a "lifetime warranty" can mean whatever the seller wants it to mean, according to the Colorado Attorney General's Office; however, the Federal Trade Commission states that a warranty MUST state the EXACT number of years. 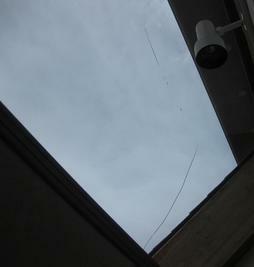 We have had calls about a certain solar screen dealer claiming "lifetime warranty". This material is not of the quality that the material we use in our solar screen manufacturing process. Q: CAN WINDOW TINT CRACK MY WINDOWS? cracking occurs. 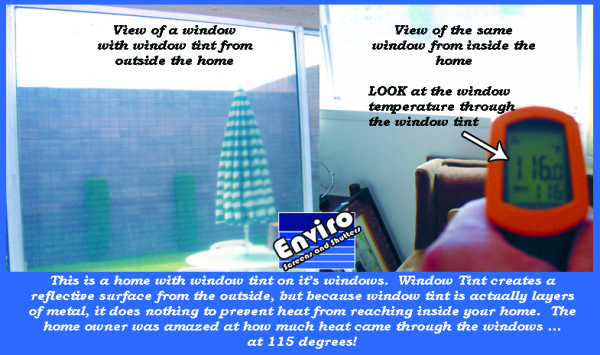 The simple fact is this ... window tint heats up the window to the point of cracking, but it's not just window tint. The reflective window shades similar to what we place in cars also crack windows .. yes it can crack your car window as well. cause seal blow-outs resulting in moisture between your panes of glass. Q: SHOULD I LEAVE MY SOLAR SCREENS ON DURING THE WINTER? A: This is a customer's preference. However, solar screens do provide some insulation for your windows and we do recommend that a customer try the solar screens n the windows for one winter and compare the difference. During the winter, the sun is at about 30 degrees on the horizon in Colorado. 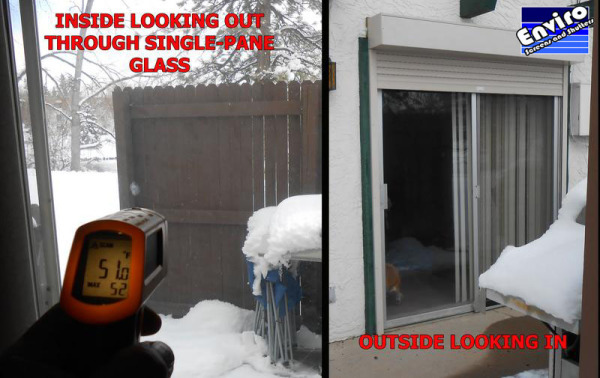 This actually provides more passive solar to pass through the solar screen to reach the window, but it also allows the solar screen to insulate the window against the cold temperatures ... keeping the cold winds off the glass much like a storm door. Additionally, there are less daytime hours in the winter season, it is also usually more overcast, limiting your chances of passive solar heating. Solar Screens also create a barrier for thermal equilibrium keeping the temperature of the glass warmer. The warmer you keep the glass, the less convection heat you need to use in your house, conserving energy. Q: DOES SCREEN COLOR REALLY MAKE A DIFFERENCE? A: YES! I cannot even begin to tell you how much. The following pics are from one of our customers who bought Interior Shades from a shade and blinds dealer in Colorado (before they discovered us). As we were installing their rolling shutters the Customer asked me why his familyroom was so warm even though he had new expensive windows and an interior shade on his window. I asked, "are you sure you want to know?" I explained that first and foremost, Interior Shades do not stop the heat coming into the house ... Interior Shades are merely light control -- anyone who tells you different is, well, we will call it "uninformed". Black fabric, or even Brown, offer the best visibility when looking out of your home. THAT'S A GREAT THING! However, both of these colors offer the best Solar Absorbance (remember we talked about this in a previous Question). While this is great for EXTERIOR shades, when you use something that attracts the heat and dispurses it inside of a home/business, as it is designed to do outside of your home, thus you have effectively installed a "heater" inside your home. allowing heat through to keep your windows warmer.